Calling locomotive lovers of all ages! Train Days is rolling back into the San Bernardino County Museums in Redlands and Apple Valley, April 6 to 14. This popular annual event features intricate, operating model trains, a riding train, and family programming. At the San Bernardino County Museum in Redlands, the event opens with an “Off the Rails” dance party for families from 11 a.m. to 3 p.m. Model train layouts will be running throughout the museum and a trackless train will be available for ticketed rides on the weekends. Train clubs participating include the ZoCal Z-scale Group, N-Land Pacific Modular Club, Green River Junction Railroad, and the Orange County N’Gineers who will be leading instructions on module building for visitors. Rail safety education organization Operation Lifesaver will be providing safety information. 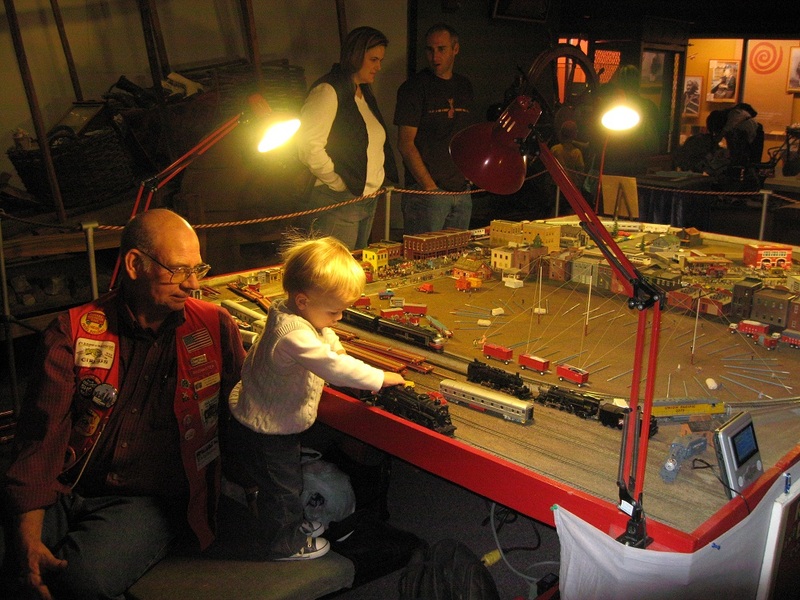 At Victor Valley Museum, model train layouts will fill the museum for the weeklong event by returning local train clubs Antelope Valley N’ Scalers and Sun City Train Club. Featured are daily train activities and crafts for families, and a “chugging” photo booth station. A trackless train will be available for ticketed rides on the weekends. Event partners include Mojave National Preserve: Kelso Depot and Route 66 Mother Road Museum both sharing High Desert railroad history and its role within the community, and rail safety education organization Operation Lifesaver. Train Days and the County Museum’s other exciting events and exhibits reflect the effort by the Board of Supervisors to achieve the Countywide Vision by celebrating arts, culture, and education in the county, creating quality of life for residents and visitors. The San Bernardino County Museum is at 2024 Orange Tree Lane, Redlands. The museum is open Tuesdays through Sundays from 9 a.m. to 5 p.m. General admission is $10 (adult), $8 (military or senior), $7 (student), and $5 (child aged 5 to 12). EBT cardholders are $1. Children under 5 and Museum Association members are admitted free. EBT cardholders are $1.Children under 5 and Museum Association members are admitted free. Train Days is included with museum admission. Parking is free. For more information, visit www.sbcounty.gov/museum/. The museum is accessible to persons with disabilities. 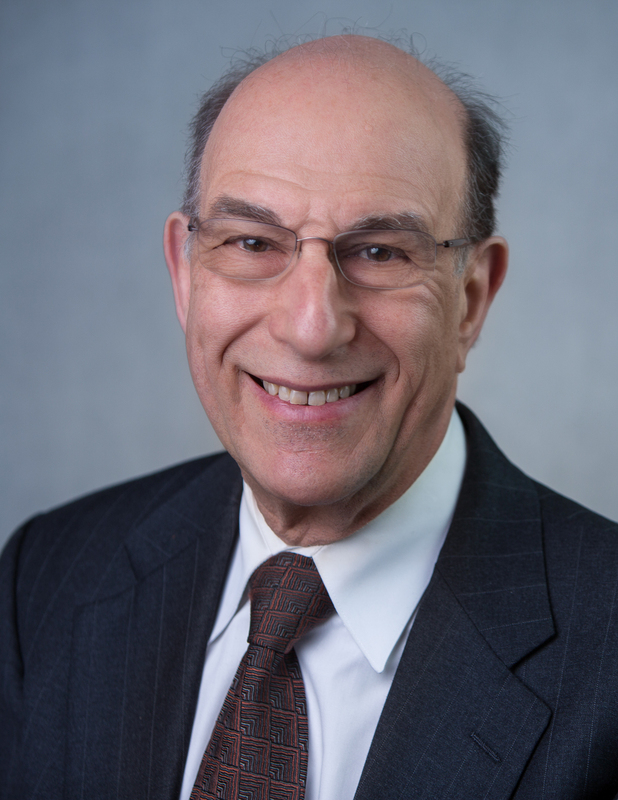 Richard Rothstein, author of The Color of Law: A Forgotten History of How our Government Segregated America, is the featured Dome Talks speaker on Thursday, Feb. 28 at the San Bernardino County Museum. The book examines the common misperception that divisions in communities were primarily the result of individual prejudices, income differences, or the actions of private institutions like banks and real estate agencies. 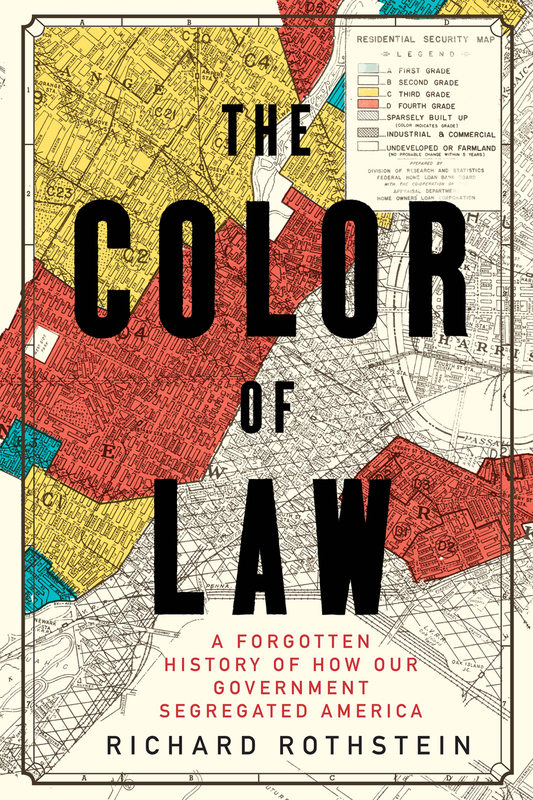 Starting in the 1920s, during a time when millions of African Americans moved in a great historical migration from the south to the north, The Color of Law investigates and exposes the laws and policy decisions — some now forgotten or rescinded — passed by local, state, and federal governments that actually promoted discriminatory patterns that continue to this day. All Dome Talks evenings open at 6:30 p.m. for a light reception sponsored by the San Bernardino County Museum Association. Rothstein’s talk starts at 7 p.m. and will include sales of his book and signing. Tickets for the evening are $25 ($18 museum members), subject to availability as the Dome Talks theater has limited seating. Tickets can be purchased online at www.sbcounty.gov/museum or may be purchased at the Museum’s Guest Services Desk. The San Bernardino County Museum’s exhibits of regional, cultural and natural history and the Museum’s other exciting events and programs reflect the effort by the Board of Supervisors to achieve the Countywide Vision by celebrating arts, culture, and education in the county, creating quality of life for residents and visitors. The San Bernardino County Museum is at 2024 Orange Tree Lane, at the California Street exit from Interstate 10 in Redlands. Parking for Dome Talks is free. For more information, visit www.sbcounty.gov/museum. The museum is accessible to persons with disabilities. 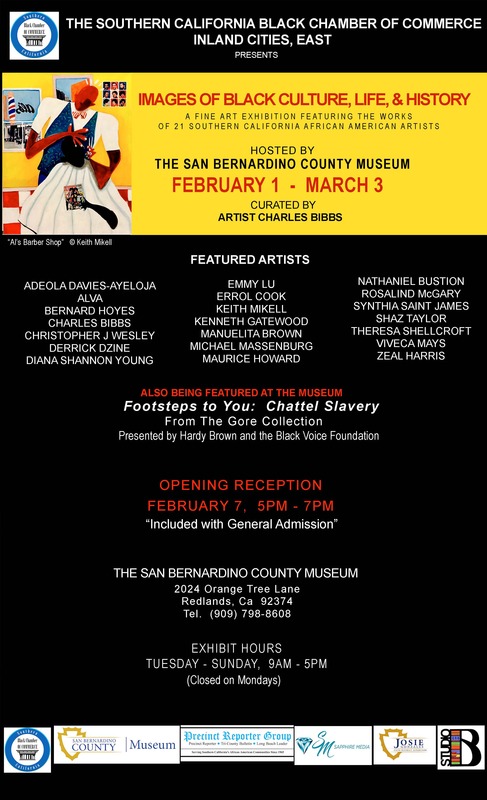 The San Bernardino County Museum, in partnership with the Southern California Black Chamber of Commerce, Inland Cities, East, presents an exhibit featuring the fine art works of prominent African American artists from throughout Southern California to recognize Black History Month. “Images of Black Culture, Life, & History” opens at the Museum on Feb. 1 and continues through Mar 3. The Chamber hosts an exhibit reception at the Museum on Thursday, Feb. 7 from 5 to 7 p.m. 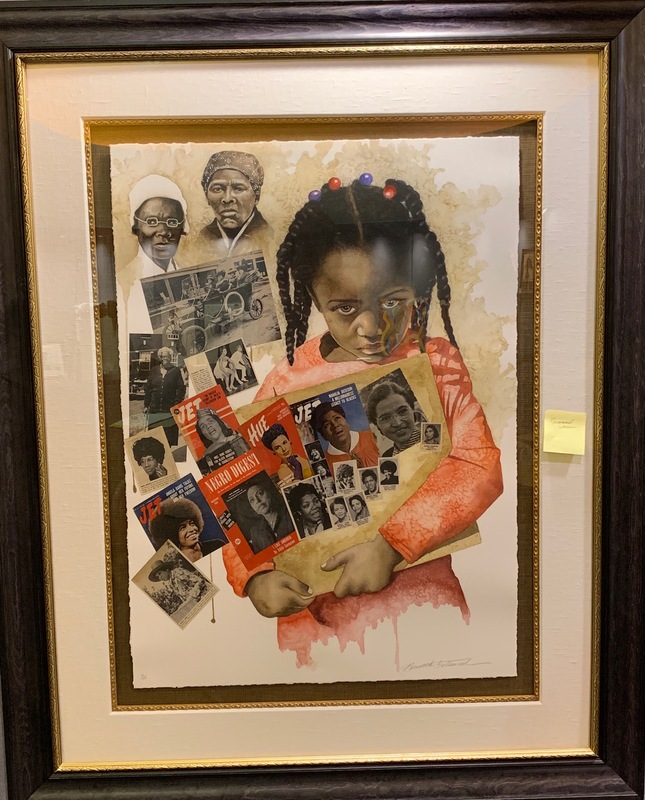 Guest curated by Charles Bibbs, who also has two works in the show, the artists participating include Adeola Davies-Ayeloja, Alva, Bernard Hoyes, Christopher J. Wesley, Derrick Dzine, Diana Shannon Young, Emmy Lu, Errol Cook, Keith Mikell, Kenneth Gatewood, Manuelita Brown, Michael Massenburg, Maurice Howard, Nathaniel Bustion, Rosalind McGary, Synthia Saint James, Shaz Taylor, Theresa Shellcroft, Viveca Mays, and Zeal Harris. The show includes paintings, watercolors, collages, ceramics, and quilts. The San Bernardino County Museum’s exhibits of regional cultural and natural history and the Museum’s other exciting events and programs reflect the effort by the Board of Supervisors to achieve the Countywide Vision by celebrating arts, culture, and education in the county, creating quality of life for residents and visitors. The San Bernardino County Museum is at 2024 Orange Tree Lane, at the California Street exit from Interstate 10 in Redlands. The museum is open Tuesdays through Sundays from 9 a.m. to 5 p.m. General admission is $10 (adult), $8 (military or senior), $7 (student), and $5 (child aged 5 to 12). EBT card holders and families are admitted for $1. Children under five and Museum Association members are admitted free. This special exhibit is included with museum general admission. Parking is free. For more information, visit www.sbcounty.gov/museum. The museum is accessible to persons with disabilities. 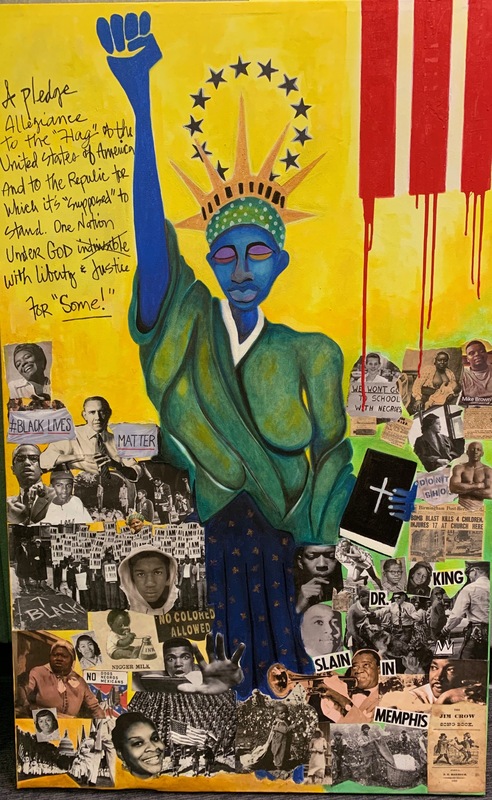 In honor of Black History Month, the Southern California Black Chamber of Commerce, Inland Cities East will be hosting its annual Black Art Exhibit at the San Bernardino County Museum. The exhibit will run from Friday, Feb. 1 until Sunday, March 3. A reception will also he held on Thursday, Feb. 7 from 5 to 8 p.m. which will include the artists, local dignitaries along with business and community leaders. The San Bernardino County Museum is at 2024 Orange Tree Lane in Redlands. Read this flyer for more information on the event. The San Bernardino County Museum announces the speakers confirmed for the 2019 Dome Talks series. The lineup of national authors and thought leaders address timely, serious, quirky, and critical issues. These evening discussions are scheduled monthly from January through June. Full Series Passes, which include a ticket for each evening, are now on sale. Individual tickets go on sale beginning Dec. 14. Dome Talks commences on the evening of Jan. 17, with Kirk W. Johnson, author of The Feather Thief: Beauty, Obsession, and the Natural History Heist of the Century, his investigation into the true crime story of the theft of 299 rare bird skins from a British natural history museum. Johnson brilliantly traces a narrative from the 19th century to present day about exotic bird exploration, ornithological research, the obscure and quirky world of Victorian fly-tying, and rare bird trafficking. On Mar. 28, Heather David, cultural historian and advocate for the preservation of mid-century modern architecture, art, and signage, speaks about her book Motel California. The story of the rapid rise and subsequent decline of the individually owned mom-and-pop motel in The Golden State, Motel California is a celebration of sparkling blue pools, flashing neon signs, automatic ice machines and bleached white towels. It is an exploration of theme-based marketing and a documentation of American culture at perhaps what was the most prosperous time in United States history. On Apr. 25, Francis French, co-author of Falling to Earth: An Apollo 15 Astronaut’s Journey to the Moon, discusses his career co-writing four bestselling space history books and interviews with astronauts Wally Schirra, Gordon Cooper, Scott Carpenter, Pavel Popovich, and Al Worden. Currently the Director of Education at the San Diego Air & Space Museum, French is a regular presence on PBS, The Discovery Channel, History Channel and Science Channel. Rue Mapp speaks on May 30 about the organization she founded, Outdoor Afro, a nonprofit social community reconnecting African Americans with natural spaces through outdoor recreational activities. The evening is co-sponsored by the Girl Scouts of San Gorgonio and San Bernardino County Regional Parks. Through Outdoor Afro, Mapp shares opportunities to build a broader community and leadership in nature. Her important work has generated widespread national recognition including The Root 100 most influential African Americans in the country, the Outdoor Industry Inspiration Award, the National Wildlife Federation Communication award, and Family Circle Magazine selected Rue as one of America’s 20 Most Influential Moms. June 20 is the final speaker in the series, Danna Staaf, author of Squid Empire: The Rise and Fall of the Cephalopods, an epic adventure spanning hundreds of millions of years, from the marine life of the primordial ocean to the calamari on tonight’s menu. The Inquisitive Biologist’s review noted “This, ladies and gentlemen, is how you write a good popular academic book.” Anyone who enjoys the undersea world—along with those obsessed with all things prehistoric—will be interested in the sometimes enormous, often bizarre creatures that ruled the seas long before the first dinosaurs. All Dome Talks evenings open at 6:30 p.m. for a light reception sponsored by the San Bernardino County Museum Association. Presentations start at 7 p.m. and include book sale and signing where applicable. Books are available for sale in the Museum store starting in November. Full Series Passes are on sale for $130 ($105 museum members) and include all six evenings. Tickets for individual evenings will go on sale December 14 for $25 each evening ($18 museum members, no discount applies for May 30) and are subject to availability as the Dome Talks theater has limited seating. Tickets can be purchased online at www.sbcounty.gov/museum or may be purchased at the Museum’s Guest Services Desk. Advance ticket purchase is strongly encouraged as walkups are not guaranteed. No refunds can be made for ticket purchases, but unused tickets may be donated to the nonprofit San Bernardino County Museum Association in advance of the date. 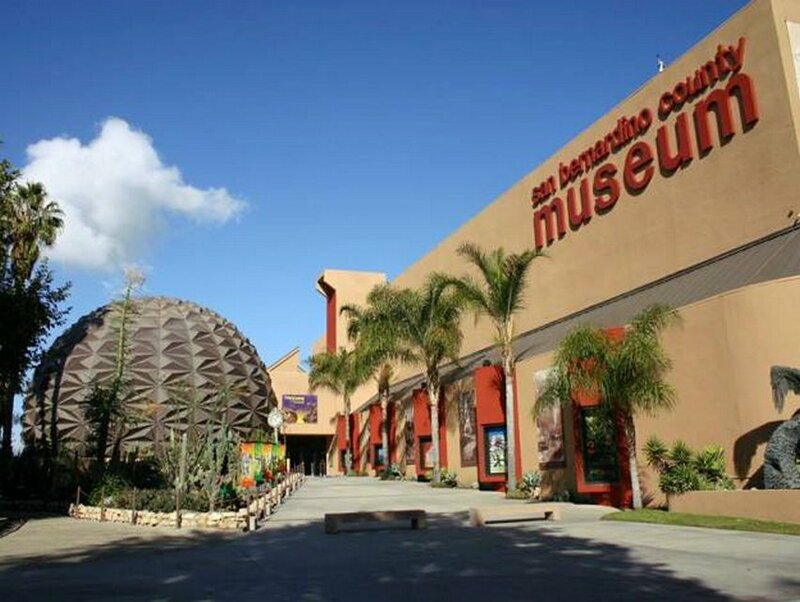 The San Bernardino County Museum’s exhibits of regional cultural and natural history and the Museum’s other exciting events and programs, including Dome Talks reflect the effort by the Board of Supervisors to achieve the Countywide Vision by celebrating arts, culture, and education in the county, creating quality of life for residents and visitors. The San Bernardino County Museum is at 2024 Orange Tree Lane, at the California Street exit from Interstate 10 in Redlands. The museum is open Tuesdays through Sundays from 9 a.m. to 5 p.m. General admission is $10 (adult), $8 (military or senior), $7 (student), and $5 (child aged 5 to 12). Children under five and Museum Association members are admitted free. Parking is free. For more information, visit www.sbcounty.gov/museum. The museum is accessible to persons with disabilities. Live sheep shearing and yarn spinning – how wool clothing gets made – has changed little over the centuries and will be on full display at Sheep to Shawl at the San Bernardino County Museum on Saturday, Sept. 29, from noon to 4 p.m.
To make a piece of natural fiber clothing artisans start with the plant or animal to furnish the material from which it is made: a sheep, goat, rabbit, llama, or plant fibers. Natural textiles are based on these fibers, whether fleece, fur, hair, or plant. During Sheep to Shawl, Museum visitors will be able to meet fur and fleece-bearing animals thanks to the University of California Cooperative Extension 4-H club members and Southern California Sheep/Wool. 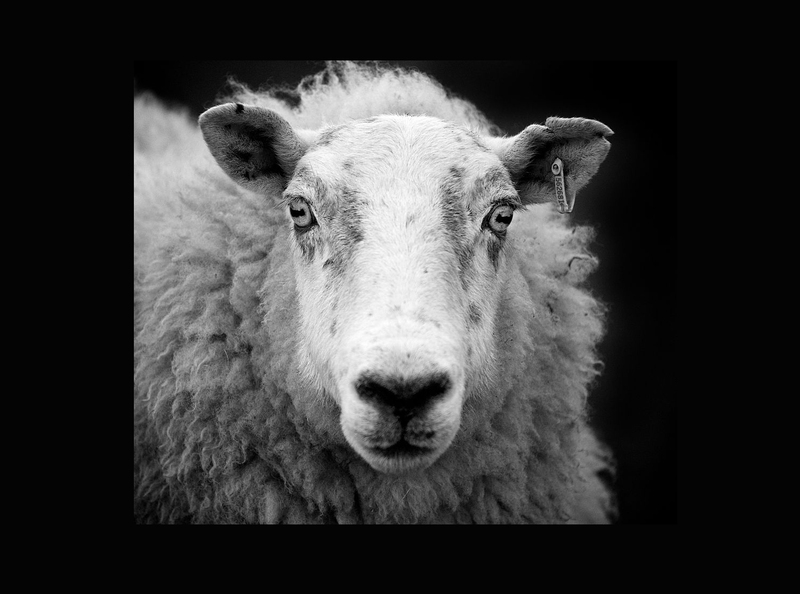 Members of the local 4-H program will demonstrate how a live sheep is sheared (1 p.m., 2 p.m. and 3 p.m.) and how the wool is cleaned by removing twigs and less savory bits of debris. Volunteers from local textile groups, and skilled artisans will demonstrate carding wool so the fibers lay straight, spinning them into thread, and weaving the threads into cloth. Hands-on opportunities to touch fleeces, spin, design, and weave bracelets and potholders will be offered along with demonstrations of spinning and weaving by the Southern California Handweavers Guild and the Crosstwisters lacemaking group. At 1:30 p.m. youth from the 4-H program will hold a wool fashion show. Visitors can also walk through the museum’s ethnobotany and native plant gardens to see sources of plant fibers used by Native Americans. Activities are suitable for all ages. Sheep to Shawl and the Museum’s other exciting programs and exhibits reflect the effort by the Board of Supervisors to achieve the Countywide Vision by celebrating arts, culture, and education in the county, creating quality of life for residents and visitors. Join us for popcorn and movies this summer! 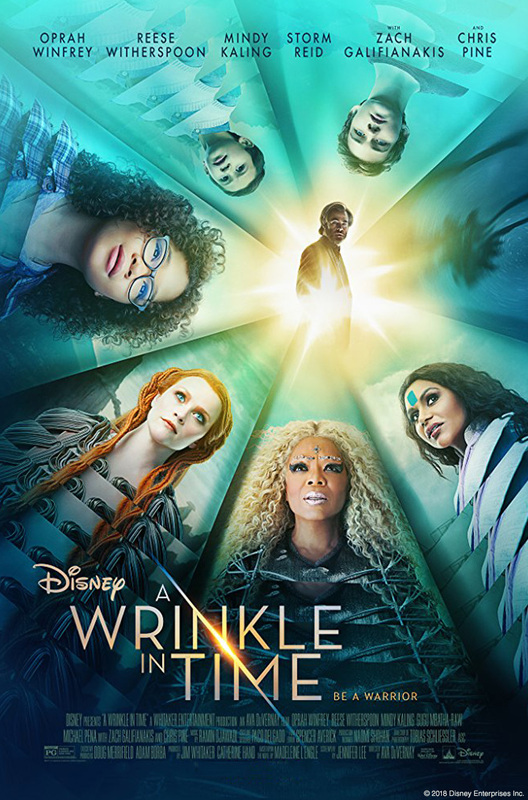 The Victor Valley Museum’s summer movie series starts on Sunday, July 29, with a screening of the 2018 film “Wrinkle in Time.” The film will start at noon, and the movie and refreshments are included with museum general admission. On August 10, the series continues with “The Cowboy and the Senorita,” the 1941 classic B western that marks the first appearance of Roy Rogers and Dale Evans together on the silver screen. “Paddington 2” will screen on Saturday, August 25. 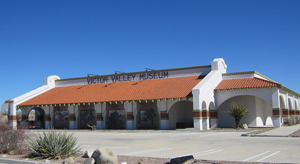 The Victor Valley Museum is a branch of the San Bernardino County Museum located at 11873 Apple Valley Road in Apple Valley. The museum is open Wednesday through Sunday from 10 a.m. to 4 p.m. Admission is $5 (adult), $4 (senior or military), and $2.50 (student. EBT cardholders are $1. Children under 5 and San Bernardino County Museum Association members are free. Parking is free. For more information, visit www.sbcounty.gov/museum. The museum is accessible to persons with disabilities. The San Bernardino County Museum hosts the popular annual Public Works Day on Saturday, June 2, from 11 a.m. to 4 p.m. 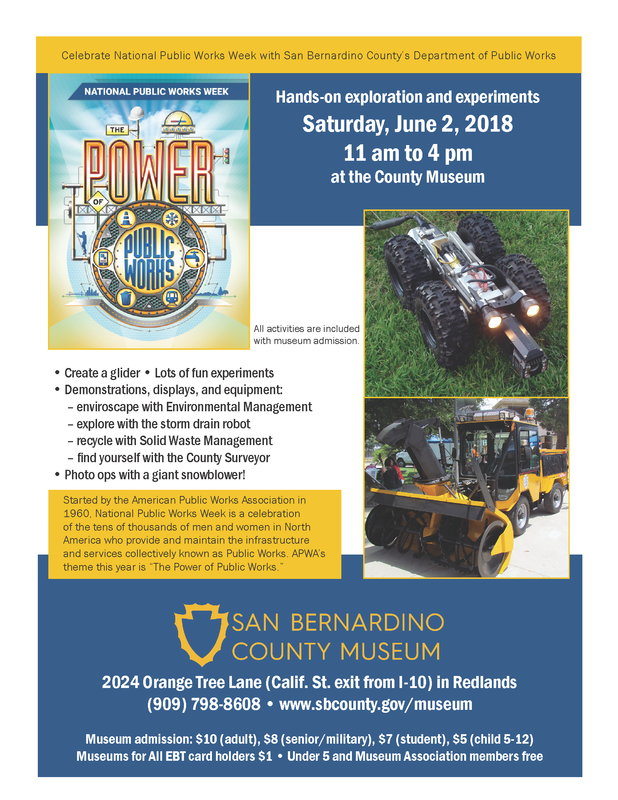 The day features a wide variety of hands-on activities related to engineering and science, in partnership with the San Bernardino County Department of Public Works. Started by the American Public Works Association in 1960, National Public Works Week is a celebration of the tens of thousands of men and women in North America who provide and maintain the infrastructure and services collectively known as public works. Activities and demonstrations at the museum are especially designed to engage children and families with hands-on learning: create a glider, conduct experiments, explore with a storm drain robot, find yourself with the County Surveyor, learn to keep storm drains clean with Environmental Management, and recycle with Solid Waste Management, have your photo taken in a giant snow blower. Hands-on learning activities related to science and technology and the County Museum’s other exciting events and exhibits reflect the effort by the Board of Supervisors to achieve the Countywide Vision by celebrating arts, culture, and education in the county, creating quality of life for residents and visitors. The San Bernardino County Museum is at 2024 Orange Tree Lane, at the California Street exit from Interstate 10 in Redlands. The museum is open Tuesdays through Sundays from 9 a.m. to 5 p.m. General admission is $10 (adult), $8 (military or senior), $7 (student), and $5 (child aged 5 to 12). EBT cardholders are admitted for $1. Children under five and Museum Association members are admitted free. All activities are included with museum admission. Parking is free. For more information, visit www.sbcounty.gov/museum. The museum is accessible to persons with disabilities. The San Bernardino County Museum will celebrate their third annual May the Fourth event, Friday, May 4, 6 to 8 p.m. in honor of what popular culture has dubbed “International Star Wars Day.” The science-based, hands-on party underscores the imagination and fun of the Star Wars science fiction phenomenon and will feature an exciting appearance by members of the Inland Empire Squad of the Southern California Garrison, 501st Legion in full trooper regalia. Guests are encouraged to arrive in their own creative costumes. 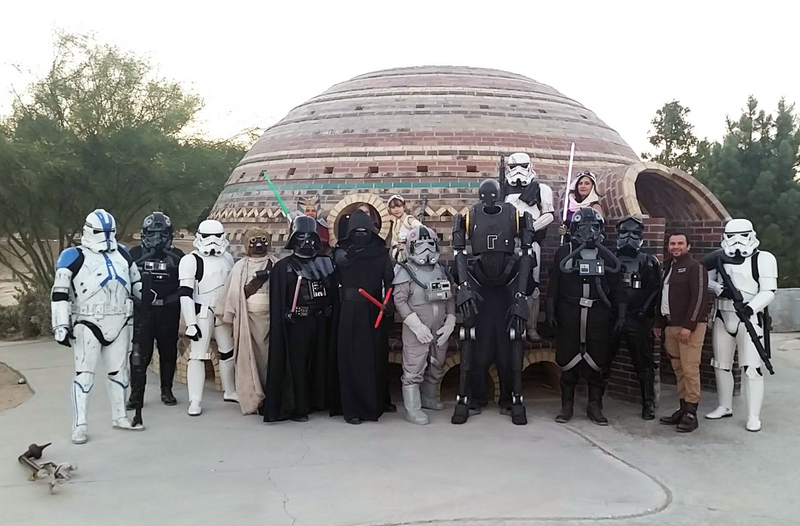 May the 4th is informally recognized as Star Wars Day, as the date provides an easy pun, first coined in 1979, on the Star Wars phrase “May the Force be with you.” The museum’s third annual event will also feature StarLab, a portable planetarium with views of the galaxy, DJ Eturnal spinning space and Star Wars themed dance music throughout the night, a photo booth, and themed scavenger hunts. Light refreshments for the whole family will be hosted by the San Bernardino County Museum Association. Admission is $10 per adult and $5 for children age 12 and under and Museum members. May the Fourth and the County Museum’s other exciting events and exhibits reflect the effort by the Board of Supervisors to achieve the Countywide Vision by celebrating arts, culture, and education in the county, creating quality of life for residents and visitors. The San Bernardino County Museum is at 2024 Orange Tree Lane, at the California Street exit from Interstate 10 in Redlands. Parking is free. For more information, visit www.sbcounty.gov/museum. The museum is accessible to persons with disabilities. Join Master Gardeners from University of California Agriculture and Natural Resources at the Victor Valley Museum for two workshops on High Desert gardening on Saturday, March 17. Both classes are offered without charge in the museum’s community room. You can select one or both workshops, and reservations are not required. In “Growing and Preserving Fruits and Vegetables,” from 9 a.m. to noon, find out what edibles you can grow in your High Desert backyard, and learn how to preserve your harvest. This class is taught by UCCE (UC Cooperative Extension) Master Gardeners and Master Food Preservers. From 1 to 4 p.m., learn from UCCE Master Gardeners about selecting and caring for beautiful, drought-resistant plants in “Drought-Resistant Sustainable Landscapes.” The neighbors will be green with envy. The classes are offered at no cost, but museum admission is not included. Now showing at the Victor Valley Museum are exhibits that focus on High Desert cultural and natural history along with “Visions of Southern California: The Mid-Century Modern Designs of Paul Revere Williams and Maria Kipp,” and CuriousCity, an interactive experience especially for toddlers. The Victor Valley Museum is a branch of the San Bernardino County Museum located at 11873 Apple Valley Road in Apple Valley. The museum is open Wednesday through Sunday from 10 a.m. to 4 p.m. Admission is $5 (adult), $4 (senior or military), and $2.50 (student. Children under 5 and San Bernardino County Museum Association members are free. Parking is free. For more information, visit www.sbcounty.gov/museum. The museum is accessible to persons with disabilities.